Leaks are a big tell for when you need to get your roof repaired. If you notice in your attic any damp places especially after a rainstorm, then it’s time to call for professional help. You should also keep an eye out for any water stains on your ceiling, not only does this mean there is probably a leak, but it also means that it is doing some damage to the inside of your home. Drafts are another key problem, all though they are not always directly related to a faulty roof. A cool draft could mean issues with the roof or vents, but always leads to higher energy bills for heating and cooling your home. Even if you have neither of these warning signs, that doesn’t mean that your roof is all set. If you realize that you haven’t gotten your roof inspected in a number of years, then maybe it is time to get a more thorough look. What is an Interior Roof Inspection? 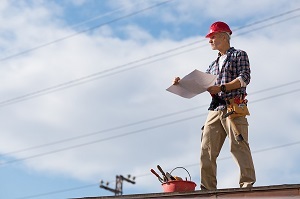 What is an Exterior Roof Inspection? On the outside of your house, there are a lot of signs that you should get your roof replaced, but we aren’t always out there looking ourselves. The inspector is going to climb on top of your house to look for leaks, the condition of your chimney, and the condition of the shingles. If your roof is missing shingles, then that means there could be a leak in your roof, and it needs to be repaired. Whether you have a roof with shingles or another material, inspectors are looking for warning signs to determine what the issues are and if you need your roof repaired. Water damage is generally caused by many different issues like clogged gutters not allowing proper draining, shingles being blown off from storms, or improperly installed shingles allowing for water to seep in. Mold will grow just about anywhere that is moist, so inspectors will be looking around the chimney and in the insulation in the attic. Sagging roof line could be a simple and easy fix or could mean something is wrong with the structure of your home. If you notice some of these issues with your roof, then be sure to call the professionals at Homeinex Corporation. We have been providing in-depth inspections in Massachusetts, Connecticut, Maine, Rhode Island, and New Hampshire for over twenty-five years. Trust that our inspectors to get the job done.